Should the Drawers be Emptied or Removed? This is a large subject, as it overlaps into many different furniture pieces. If the piece is large, like a large dresser, chest, or armoire, it is always easier to move when the drawers are removed—even when the drawers are empty. Many customers—and even some workers—will say, “Oh those drawers will not add much weight.” Don’t believe them! The removal of the drawers will always subtract significant weight. For pieces like armoires and high boys, removing the drawers is essential. For dressers, it can be optional. A compromise option is to remove some of the drawers. If you do this, remove them equally so as to spread the weight throughout the piece. For some large armoires, removing the drawers is what turns it from an uncomfortable, barely manageable piece which you need a handtruck for–to a piece which can be comfortably carried by two men. 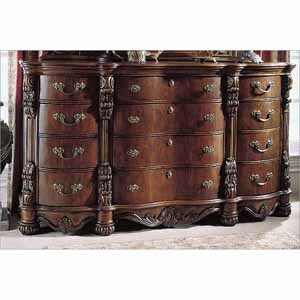 For some large dressers and chests, removing the drawers will reduce the piece’s weight down by 50%. It makes the difference between the workers struggling to control the piece and ending up banging the walls, and the workers being able to easily tilt the piece this way to and fro and finese it around tight corners and down difficult stairs. Often the workers who are most adamant about carrying the piece “full” are the ones least able to do so. They are the inexperienced and insecure workers who are trying to assert their strength and skill when they may have neither. “Banging walls” with furniture is one of the most common cause of Claims. The more drawers in the piece, and the fuller the drawers, the heavier the overall piece, and the more likely it is to cause damage when the walls are banged. If it is really heavy, then the slightest “tap” of the wall can cause damage. Even though it looks like the tap is gentle, there is so much weight behind the piece that the wall is instantly gouged. And if the furniture piece has a fine finish, then its finish is also scratched. Up the ante to a heavier piece like a refrigerator, and a tapping of the wall is even more likely to cause damage to the wall, though the refrigerator itself will probably not scratch as easily. This entry was posted in Residential Moves and tagged Drawers, Dressers by Bob McGregor. Bookmark the permalink.